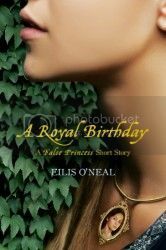 As soon as I heard that Eilis O'Neal had written an e-short story called A Royal Birthday, I got so excited! I loved The False Princess, so any little peek back into that world is highly welcome. Check out my review, if you're not already convinced. Want to win your own hardcover copy of The False Princess? Leave a comment on the blog, I'll draw names from a hat and announce a winner next week! The giveaway is for US and Canada only. This e-short prequel to The False Princess will appeal to fans of Shannon Hale and Tamora Pierce, giving them a new author to love and a new fantasy world to enter, a world filled with wizardry, mystery, and just the right touch of romance. This prequel introduces the court of Thorvaldor, Nalia, its princess, who has reached the magical age of sixteen, and her best friend, Kiernan, the earl's son who loves her but feels he is too far below her in rank to dream of making a match with her. The novel on which this e-short is based has received glowing reviews, been named a YALSA 2012 Best Fiction for Young Adults, and made numerous state master lists (Georgia, Rhode Island, Utah, and Maryland). awesome!! I didn't realize there was a short story released. I'm off to find that now. Thanks for the heads up, and the chance to win!